The Sands of Time only caught a passing interest from me. Movies based on games tend to be a hit and miss venture with most of the time being a miss. Add to that Disney’s involvement and this project had caution written all over it. That is until I watched the trailer. Now I'm excited about Prince of Persia. The effects looks good. I like the use of a broader variety of weaponry especially the more exotic ones used by the The Hassan sins. The trailer does a nice job of setting up the back and forth between Dastan and Princess Tamina, even if a bit cliche. I get a Romancing The Stone, Indiana Jones, Tomb Raider kind of vibe for the film. The Sands of Time hits theaters 21 May 2010. Will you watch it in the theater, rent it or don't even care? let me know in the comments. Based on the game Prince Of Persia . Dastan is a street urchin in 6th century Persia. Adopted by the king as his heir after showing valor in battle in hopes of keeping the king’s two sons from fighting over the throne. 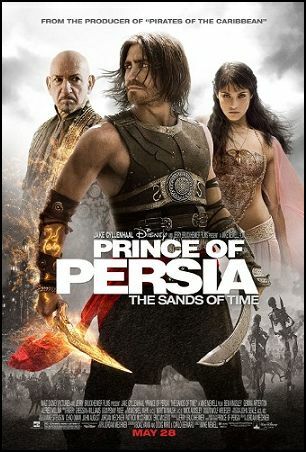 Dastan teams up with Princess Tamina to rescue the Sands of Time, a gift from the gods that controls time, from the hands of the villainous nobleman, Nizam. Older PostChuck and V Renewed!